Sunburst® Gourmet Blend is the premium companion food loaded with natural goodness for small animals. Formulated as a food and treat all in one, Sunburst® Gourmet Blends are fortified with vitamins, minerals and amino acids as well as plant-based DHA Omega-3 and protected probiotics to support immunity. What you won’t find in our Sunburst® are artificial colors, flavorings or preservatives. 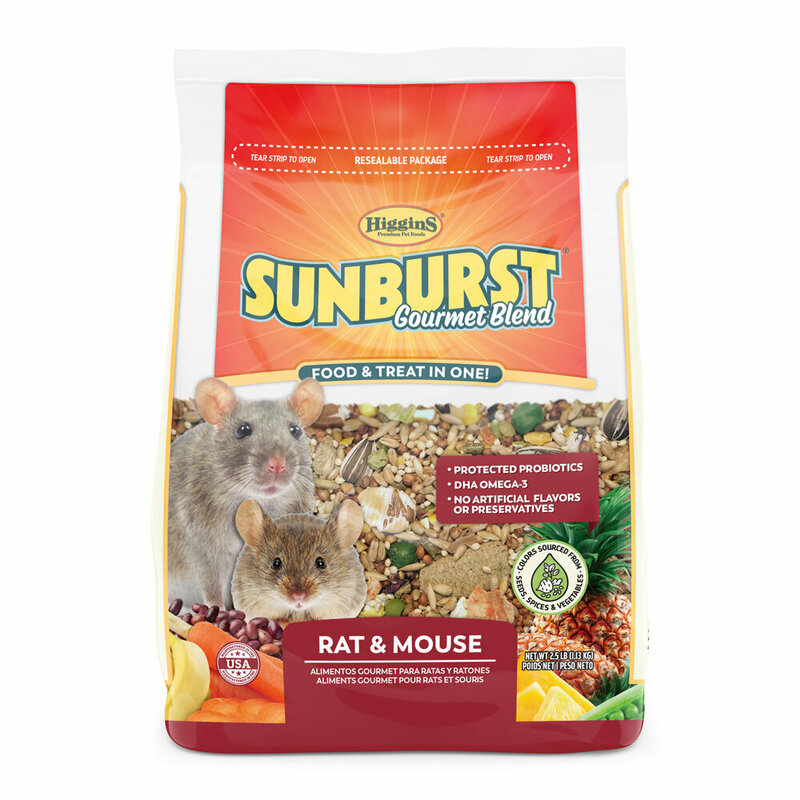 Sunburst® Gourmet Blend for Rats & Mice contains dried mixed fruits and vegetables, wholesome seeds, grains, nuts, legumes and much more! 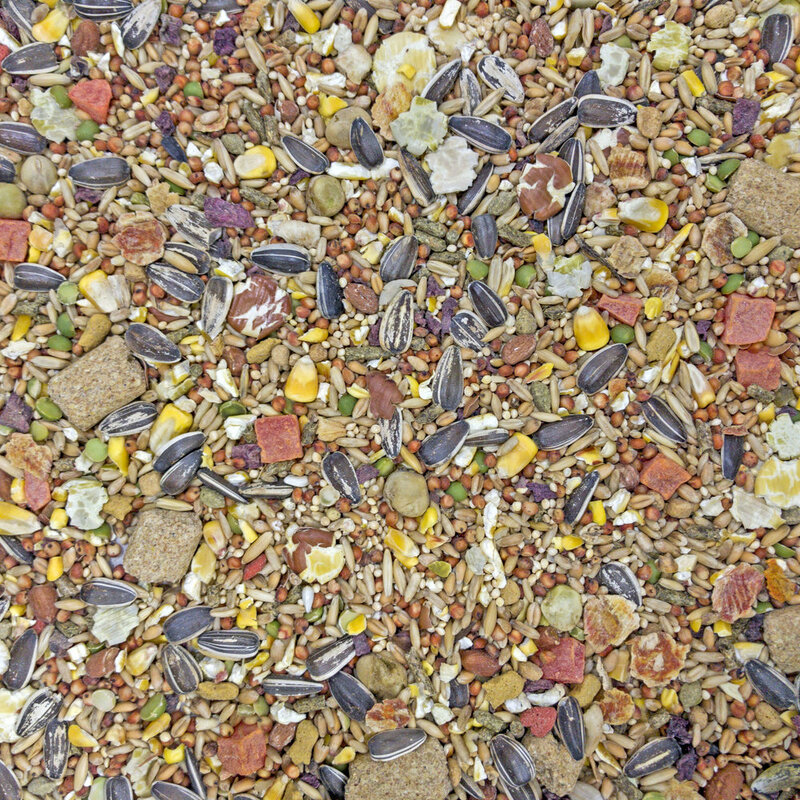 Red Milo, Oats, Corn, Wheat, White Millet, Sunflower Seeds, Flaked Beans, Peanuts, Green Split Peas, Flaked Peas, Flaked Carrots, Papaya, Beets, Green Peas, Bananas, Ground Corn, Brown Rice, Soybean Meal, Wheat Middlings, Ground Wheat, Sun-Cured Timothy Hay, Sun-Cured Alfalfa Meal, Dried Beet Pulp (sugar removed), Vegetable Oil, Cane Molasses, Sugar, Canola Oil (preserved with mixed tocopherols), Dicalcium Phosphate, Color Added (Algae Meal, Annatto Extract, Turmeric, Beet Juice), Dried Enterococcus Faecium Fermentation Product, Dried Lactobacillus Acidophilus Fermentation Product, Dried Lactobacillus Casei Fermentation Product, Dried Egg Product, Flaxseed, Calcium Carbonate, Alfalfa Nutrient Concentrate, Salt, Cranberries, Apples, Blueberries, Celery, Parsley, Lettuce, Spinach, Watercress, Brewer’s Dried Yeast, DL-Methionine, Hemicellulose Extract, L-Lysine, Iron Oxide, Choline Chloride, Mixed Tocopherols (preservative), Rosemary Extract, Potassium Chloride, Yeast Extract, L-Ascorbyl-2-Polyphosphate (Source of Vitamin C), L-Carnitine, Vitamin A Supplement, Vitamin D3 Supplement, Vitamin E Supplement, Zinc Sulfate, Ferrous Sulfate, Niacin, Folic Acid, Biotin, Manganese Sulfate, Copper Sulfate, Calcium Pantothenate, Thiamine Mononitrate, Pyridoxine Hydrochloride, Riboflavin Supplement, Zinc Proteinate, Manganese Proteinate, Copper Proteinate, Calcium Iodate, Yucca Schidigera Extract, Sodium Selenite, Cobalt Carbonate, Vitamin B12 Supplement, Natural Citrus Flavor, Natural Banana Flavor, Natural Pineapple Flavor. While introducing a new food to your rat/mouse, gradually mix Sunburst® with your pet’s old diet. Increase the amount of Sunburst® over a period of 7 to 10 days. This will allow your pet to adjust to the new food and it will prevent any upset to your pet’s digestive system. Feed your rat/mouse 2 to 3 tbsp of Sunburst® per day depending on the age of your pet. Younger animals will eat more. Always regulate the food portion to maintain your pet’s weight. Remove and discard uneaten food everyday and clean bowl prior to refilling it. Always maintain fresh drinking water near your pet’s food container.